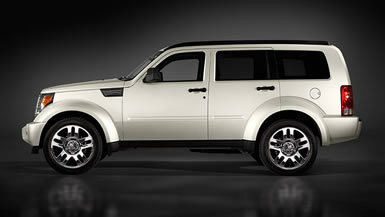 Dodge Nitro Review: Dodge’s Nitro, the brand’s first midsized SUV, features a macho, sharp-edged design. Since its debut in 2007, I have always wondered who would buy one. A Sunburst Orange Pearl Coat Nitro came my way from the press fleet, so I got a chance to find out. Well, as Gomer Pyle would say, “Surprise, Surprise.” I liked it. Was it my need for a public demonstration of my manliness? Well, no. It was more about how the car drove and performed on a day-to-day basis. Essentially a Jeep Liberty in Dodge clothing, the Nitro, built in Toledo, Ohio, has a chunky, solid, quality feeling. This is why people bought SUVs in the first place. For the off-road capability, a tall command-of-the-road driving position, and lots of cargo capacity. The Nitro’s part-time four-wheel-drive system I can’t say much about because I didn’t need it. You select it with a center console switch. I sampled it once in a dirt area and it felt locked into place. With its flat, upright windshield, shallow instrument panel, and tall, chair height seats, there’s an old-fashioned feeling to the Nitro. It reminds me of the beloved original Jeep Cherokee, but there’s nothing out-of-date in the way it actually works. The seats wore a sturdy, stain-repellent, odor-resistant orange cloth that matched the cheerful exterior. I regretted the lack of a left foot dead pedal (footrest), but quickly realized that sitting tall eliminated the need for it. From that spot, I surveyed a carefully styled interior of modest materials, lots of slate gray plastic relieved by shiny trim sections. A three-pod gauge cluster pops up out of the horizontal, hard-edged instrument panel. A circle motif shows up in those gauges, and also the interior door handles and speakers, among other places. After a couple of days, everything felt right inside the Nitro, comfortable, familiar and easy to find, and I developed a fondness that I didn’t see coming. Two special features enhance cargo capacity. The front passenger seat folds down flat, so carrying long objects completely inside the car is easy. Out back, the Load ‘N Go cargo floor slides out 18 inches to accommodate up to 400 pounds of gear. This is a lifesaver for your back. The Nitro comes in three flavors, SE, SLT, and R/T. All wear the familiar Dodge crosshair grille with bold chrome ram’s head logo. The entry-level SE gets 16-inch steel wheels, power folding mirrors, and some things you might not expect in the entry-level model, such as traction control, electronic stability control, tire pressure monitoring and SiriusXM satellite radio. The SLT gives you 17-inch wheels, a six-way power driver’s seat, power and heated mirrors, chrome interior accents and some other goodies. The R/T adds a performance suspension, massive 20-inch wheels and tires and numerous exterior enhancements for maximum appeal. All models come with a 3.7-liter V6. This engine puts out a respectable 210 horsepower and 235 lb.-ft. of torque through a four-speed automatic transmission. The R/T offers an optional 4.0-liter, 260-horsepower V6 with 265 lb.-ft. of torque running through five gears. My tester had it, and there was no problem moving the 4,200-pound Nitro along briskly with it. The EPA gives the Nitro mileage ratings of 16 City, 20 Highway with four-wheel drive, 16 and 21 with two-wheel drive. The car gets a decent 6 for Air Pollution in the EPA’s Green Vehicle Guide, but a disappointing 3 (4wd) or 4 (2wd) for Greenhouse Gases. The Nitro is not the Sierra Club’s fleet vehicle of choice. ROUTE IS BEING RECALCULATED DUE TO TRAFFIC INFORMATION. This sophisticated feature helped me make better time by routing me a back way I hadn’t considered using before, based on congestion on the usual route. A couple of days later, on a different road, the system again indicated an unexpected way to go. I was very tempted to ignore the directions, but decided that it had earned my respect. Once again, I saved a significant amount of time and aggravation. I just followed the directions, which appeared graphically and were spoken clearly by a pleasant female voice. Dodge Nitros start at $22,985 for the SE, including destination charges. The SLT starts at $25,505 and the R/T at $28,480. My test vehicle, with a raft of extras, came to $33,355 on the MSRP window sticker. There are concerns about Chrysler’s viability now. Despite some historical quality lapses and two changes of ownership in recent years, the 85-year-old company is still building a lot of vehicles, and I’d hate to see it disappear. Chrysler is offering serious deals now, so you should be able to drive home a Dodge Nitro for much less than the prices in the previous paragraph.